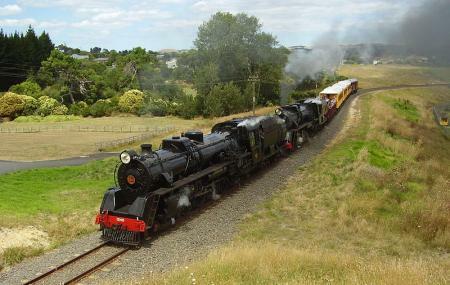 Preserving railway history of Auckland in a fun and interactive way, the Glenbrook Vintage Railway offers an hour-long train journey on Thomas (better known as Thomas and Friends) along with a range of activities for children at the ‘Imagination station’! The place offers workshops and fun activities for children including face painting, a miniature area and a bouncy castle! End the visit by shopping for some exclusive ‘Thomas & Friends’ merchandise. Children under 4 years old ride free. New Zealand dollar 5 per person or free upon showing your Train Ticket. New Zealand dollar 8 per person or New Zealand dollar 4 per person upon showing your Train Ticket. For Other Timings: Visit the official website. How popular is Glenbrook Vintage Railway? People normally club together Butterfly Creek and Robert Findlay Wildlife Reserve while planning their visit to Glenbrook Vintage Railway. Vintage railways and train station. Definitely try the return trip on scenic route $20 for adults, $10 for child under 14 years old, free for kids under 2 (by April 2019). The scenic route not that amazing but the whole vintage atmosphere with steam locomotive really interesting. They have fancy car where you can get simple high tea with snacks during trip for around $40 i think. GVR is a great experience, they've done amazing work restoring locomotives and building track to allow their operation. It has been amazing to watch the progression over the last 20 years that I've been visiting. That said, it's a volunteer organization and they need the support of visitors and donations to keep running. I definitely encourage all to give it ago. It's not the slickest well oiled tourist operation in NZ but the wonder if steam makes up for it many times over. A most enjoyable day out. Lots of extras provided for the Thomas weekend - bouncy castle, toy trains, face painting, balloons, food carts. But the trains were awesome. Well worth another visit to the train restoration workshop on less crowded days.